NASA is preparing to explore electric-powered flight with the X-57 Maxwell, a unique all-electric aircraft which features 14 propellers along its wing. Those very small, yet highly efficient motors will produce a tremendous amount of power, but with power comes heat, and too much heat can cause issues for an aircraft. Adding a cooling system to the X-57's sleek design would add bulk and require design changes that could negatively impact the aircraft's performance. To deal with the heat problem, engineers at NASA's Glenn Research Center devised a custom-designed "skin," or nacelle, around the aircraft's motor electronics to significantly cool them without changing the aircraft's shape or design. This new cooling nacelle design - the aluminum section seen behind the nose cone in the image - was proven during a recent wind tunnel test where engineers subjected one of the X-57's motors to various simulated flight conditions. With testing now complete, the design information will be sent to engineers at NASA's Armstrong Flight Research Center where they continue to work toward the X-57's first flight. NASA’s X-57 ‘Maxwell’ will be the first all-electric X-plane and will be flown to validate and demonstrate the benefits that distributed electric propulsion may yield for the future of aviation. The X-57 will undergo as many as three configurations, with the final configuration to feature 14 electric motors and propellers (12 high-lift motors along the leading edge of the wing and two large wingtip cruise motors). The goal of the X-57 is to demonstrate a 500-percent increase in high-speed cruise efficiency, zero in-flight carbon emissions, and flight that is much quieter for the community on the ground. The X-plane is being built by modifying a baseline Italian Tecnam P2006T so that it’s powered by an electric propulsion system. The advantage of using an existing aircraft design is that data from the baseline model, powered by traditional combustion engines, can be compared to data produced by the same model powered by electric propulsion. This allows NASA engineers and researchers to measure precisely the increase in efficiency that is made possible through the electric system. The X-57 Maxwell project includes four configurations and stages of research, called modifications. 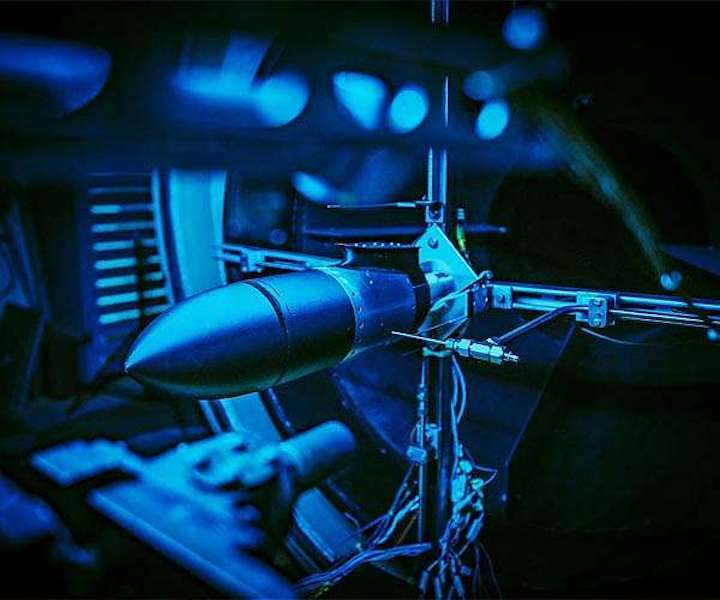 The first phase of investigating the potential for electric propulsion included defining the requirements of the research, along with systems analysis, design, and a number of tests, both in the air and on the ground. One of the earliest evaluations of Modification I included ground validation of the distributed electric propulsion high-lift system. The Leading Edge Asynchronous Propeller Technology testing, or LEAPTech, performed this validation on the Rogers Dry Lakebed at Edwards Air Force Base in California. The project was a collaboration between NASA and California companies Empirical Systems Aerospace of Pismo Beach, and Joby Aviation of Santa Cruz. An experimental electric wing, named the Hybrid-Electric Integrated Systems Testbed, or HEIST, was hoisted atop a heavily modified big rig, which drove at speeds close to 80 mph to simulate the effects of a wind tunnel. The wing was outfitted with 18 electric motors and propellers, which ran simultaneously during the lakebed runs. The tests performed in May, 2015 showed the motors produced a total of 300 horsepower. It validated that the distribution of power throughout the 18 motors generated more than double the lift at lower speeds than traditional propulsion systems. In 2015, NASA pilots and engineers also performed test flights of a production-instrumented Tecnam P2006T in the skies above and around Edwards Air Force Base. The purpose of the flights was to collect data, such as lift, drag, cruise efficiency, energy usage and ride quality. The X-57, which will be a P2006T integrated with an electric propulsion system, will be flown to gather data of similar flights. The two sets of data will be analyzed and compared by NASA, leading to efforts of validating the ability of distributed electric propulsion to improve efficiency. The project’s second phase includes several milestones in electric propulsion. In addition to continued systems testing and validation, Mod II marked the beginning of physical integration of what will become the X-57 itself. In July 2016, the fuselage and wing of NASA’s Tecnam P2006T completed the journey from Italy to the United States, arriving at Empirical Systems Aerospace in California. Upon uncrating, NASA engineers got their first look at the X-plane, which will become the first to fly under a distributed electric propulsion system. Following inspection, the aircraft underwent weight and balance testing to establish a baseline prior to the planned modifications. The aircraft was then transferred south, to Scaled Composites’ facilities at Mojave Air and Space Port, where the X-57 began its physical conversion into an electric airplane. X-57 principal investigator Sean Clarke flies the X-57 simulator at NASA’s Armstrong Flight Research Center, examining ideal maneuvers and reaction times for flight. Pilots and engineers developed and began flying an X-57 simulator at NASA’s Armstrong Flight Research Center in California, designed to feature the specifications of the electric propulsion system. 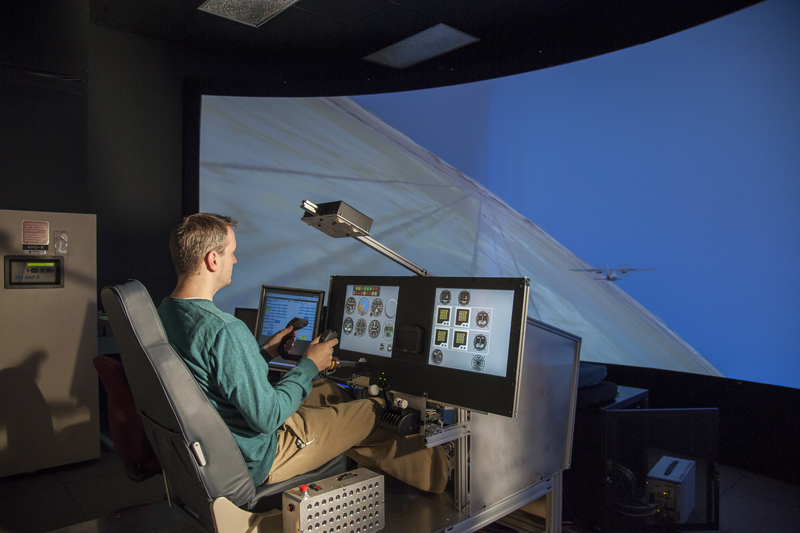 The interactive simulator began preparing pilots for X-57’s future flight testing phase. Flight control engineers and technicians at NASA Armstrong developed the simulator to provide a virtual flight experience based on what the X-plane itself will actually feel like when it’s in the air. The system helps familiarize pilots with the system, and makes them more adept with reaction times and maneuvers. Before an experimental electric system can be integrated into an aircraft, it must first be tested and validated. A 13.5-foot tall test stand is helping NASA researchers better understand the intricacies of electric motor systems, and is providing validation for the thrust of the electric motors. In addition to helping engineers anticipate system integration challenges, the stand helps to verify the components of electric propulsion. As early-stage technology is further evaluated, confidence in its use for future systems is established. Managing the differences between traditional aircraft propulsion and distributed electric propulsion is made easier by finding methods of managing those differences. The Modification II version of the X-57 will look similar to the baseline 2006T, except the two traditional inboard combustion engines will be replaced by two inboard electric motors, essentially turning the aircraft’s propulsion system electric. Shortly after the electric system is integrated into the X-57, the aircraft will undergo ground taxi tests at NASA Armstrong to examine and validate the safety and functionality of the electric system. Taxi tests will then be followed by flight tests to validate the X-57’s electric motors, battery, and instrumentation. The third phase of the project will take the X-57 to a new level of experimental electric-powered flight. Perhaps the most noticeable difference from the X-57’s Modification II configuration will be the development and integration of an experimental, high-aspect ratio wing. Designed by Xperimental of San Luis Obispo, California, the wing will feature a large reduction in area, with wing loading increasing from 17 pounds per square foot to 45 pounds per square foot. The reduction in wing area will also contribute to more efficient cruise flight through decreasing friction drag. The Modification IV effort will demonstrate that the high-aspect ratio wing with the integrated high-lift motor system will allow the X-57 to take off and land at the same speed as the baseline P2006T; the aircraft will also be less sensitive to gusts and turbulence, leading to a smoother flight. One of the most critical, and noticeable, elements of boosting cruise efficiency through electric propulsion is the relocation of the large cruise motors to the tips of the wing. The 100-horsepower Rotax 912S engines will be replaced by 60-kilowatt motors developed by Joby Aviation, reducing the weight of each motor and propeller from approximately 125 pounds to about 57 pounds. The much lighter-weight electric motors allow for their relocation outboard. By moving the cruise motors from their Mod II inboard position to the wingtips, the cruise motors will recover energy that would otherwise be lost in the wingtip vortices. Nacelles, which are outer casings that can generally act as housing for an aircraft’s engine, will also be installed along the leading edge of the wing where 12 high-lift motors could eventually be positioned. Taxi tests will once again precede flight tests at Edwards Air Force Base, and upon safety inspection and validation, the X-57 will take to the skies. Mod III test flights will seek to validate the ability of the aircraft to achieve the objective of a five-fold high-speed cruise efficiency. The final configuration of the X-57 will present the X-plane in its full, experimental configuration. 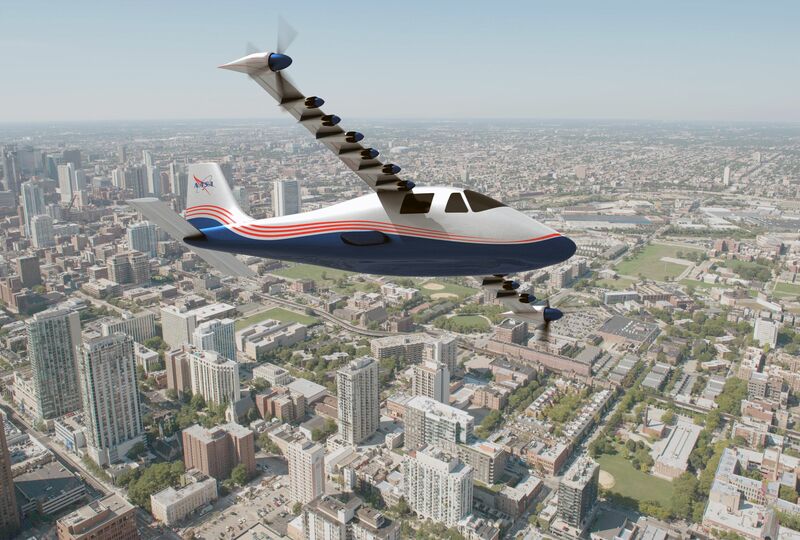 This artist's concept of NASA's X-57 Maxwell aircraft shows the plane's specially designed wing and 14 electric motors. NASA Aeronautics researchers will use the Maxwell to demonstrate that electric propulsion can make planes quieter, more efficient and more environmentally friendly. Credits: NASA Graphic / NASA Langley/Advanced Concepts Lab, AMA, Inc. The X-57, in its final form of the experiment, will feature 12 high-lift motors along the leading edge of the distributed electric propulsion wing. Similar to the 18 small motors used during ground tests, the high-lift motors would be electrically powered to generate enough lift for X-57 to be able to take off at standard Tecnam P2006T speeds even with the high-aspect ratio experimental wing. The high-lift motors and propellers would be designed to activate, along with the wingtip cruise motors, to get the X-plane airborne. When the plane levels out for cruise mode, the high-lift motors would then deactivate. The five propeller blades for each motor would then stop rotating, and fold into the nacelles, so they don’t create unwanted drag during cruise. The two wingtip cruise motors would maintain flight during this phase of the flight. When the time comes to land, the motors would then reactivate, and centrifugal force would cause the propeller blades to unfold and create the appropriate lift for approach and landing. The first piloted distributed electric propulsion X-plane will also seek to reach the goal of zero carbon emissions in flight, which would surpass the 2035 N+3 efficiency goals. Electric propulsion provides not only a five-to-ten times reduction in greenhouse gas emissions, but it also provides a technology path for small aircraft to eliminate 100 Low Lead AvGas, which is the leading contributor to current lead environmental emissions. Additionally, since the X-57 will be battery-powered, it can run off renewable based electricity, making clear the environmental and economic advantages. Goal – Five-fold reduction in energy use at high-speed cruise compared to traditional propulsion. Mod II – Demonstrate 3.0x lower energy use at high speed compared to original P2006T. Mod III – Demonstrate 1.2x lower energy use at high speed compared to Mod II. Aircraft Weight – Approximately 3,000 pounds. Maximum Operational Altitude - 14,000 feet. Critical Takeoff Speed – 58 knots (67 mph). 117 pounds each, combined weight. 11 pounds each, combined weight.